Join FRRACS and Occupy Hingham for a solidarity event in support of the #RiseTogether Weeks of Action. Folks that are fighting the Bayou Bridge Pipeline in Louisiana are calling on frontline communities to simultaneously take action to stop all pipelines and extreme energy projects. Our fight against the compressor station reaches beyond Weymouth, Quincy and Braintree. There are communities all across the country that are battling fossil fuel energy projects. You can read more about #RiseTogether and the folks fighting the Bayou Bridge pipeline here. One of the goals of the #RiseTogether Weeks of Action is to target the banks that fund the construction of pipelines and extreme energy projects. These banks are complicit in the destruction of our water, air, health, and environment. We must hold them accountable. 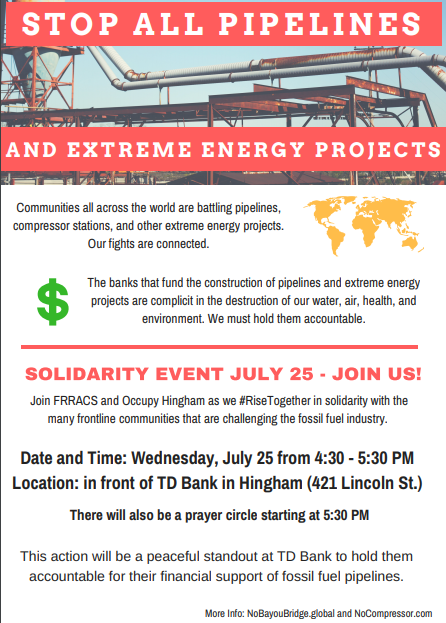 Join us for a solidarity event on Wednesday, July 25 at TD Bank in Hingham. We will gather on the public sidewalk and hold signs that bring attention to TD Bank's role in the construction of pipelines. There will be a prayer circle at the same location after the standout. Please spread the word and invite your friends and neighbors to join. Every contribution helps us bring attention to this dangerous proposed Compressor Station. www.NoCompressor.com is maintained by Fore River Residents Against the Compressor Station.